Last Thursday, Phil Orth came by and removed the Microphore toilet and tank from the nose of the 4423. It serves no purpose there as it must be maintained and "fed" in order to stay useful. He and Bones delivered it to the canyon today where it will most likely be installed in one of the subs. This is a great re-use in my opinion and a savings of several hundreds of dollars when the time comes to put a sub into service for the public. If we someday need a toilet in the nose of the 4423, I am quite sure that a Sears portapottie would do quite nicely. Now that the toilet is gone, I can start cleaning up the rust from whence it came. I wanted to work on wiring today but that was not to be. Friday, I was on my daily inspection of all things OTR and noticed water running out of the left side of the frame on the 4423. To say that I was surprised (and ticked) would be putting it mildly. I really thought that water leaks were a thing of the past. Except for the leaking radiator, of course. 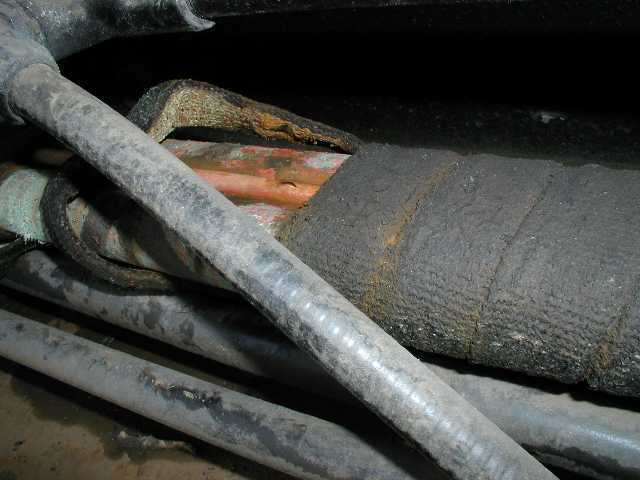 I stayed after work and traced the leak to a 3/8" copper tube that was wrapped into the bundle of copper pipes which service the cab heaters. Another freeze break is illustrated in photo 1. Oddly, this tube runs the length of the frame and is terminated in a plug. It must have gone somewhere but where, I don't know and cannot figure out. But, it was leaking and I found where it was easily cut and mashed shut. No problem as it did not do anything anyhow. Thinking that all was well, I walked around the locomotive and what to my wondering eyes should appear but water running out of the engineer's side of the frame. Again, I could not tell where it was coming from but it was dripping from the wrapped cab heater copper pipe. Well, at this point, I decided that I had had it for a Friday afternoon. Today was the day to chase down the new leak. Unfortunately, the piping in question was behind the automatic air brake filter housing so my first challenge was to remove this. I am continually surprised at how easily things come apart on the 4423. The bolts were even coated with anti seize. Once the filter was out of the way, photo 2 shows the piping as I found it. After liberal application of a box cutter to the obviously asbestos free wrapping, I found that there were 2, 3/8" copper tubes wrapped in with the 2 heater pipes. After unwrapping as much as I could reach, I could see no leak. So, I started the engine and that sure made a difference. Water was pretty much poring out of the pipe bundle but I could not see where it was coming from. I was really afraid that one of the heater pipe flanges had cracked. In a moment of frustration, I yanked on the 3/8" tube and found that I was looking at a loop of tubing that went up to almost the cab floor and then back down. Well, freeze break number 4 was right at the apex of the curve as shown in photo 3. After cutting the tube and mashing it flat, the leak was gone. I am not totally sure of the reason for the copper tube but have an idea. 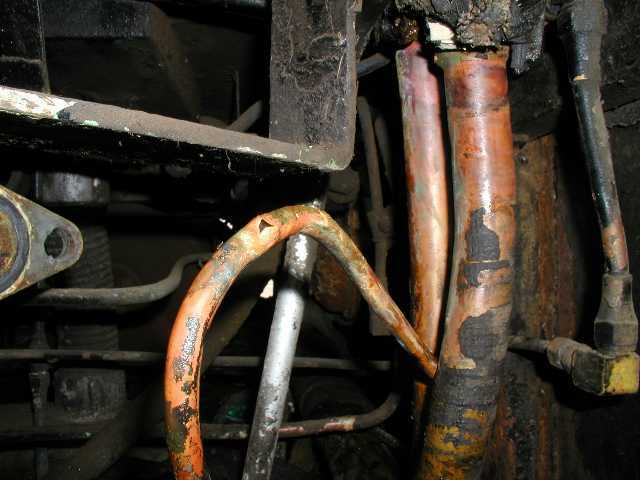 If the cab heaters were shut off at the main valve, engine water flowing through the copper tube would tend to keep the pipes from freezing. 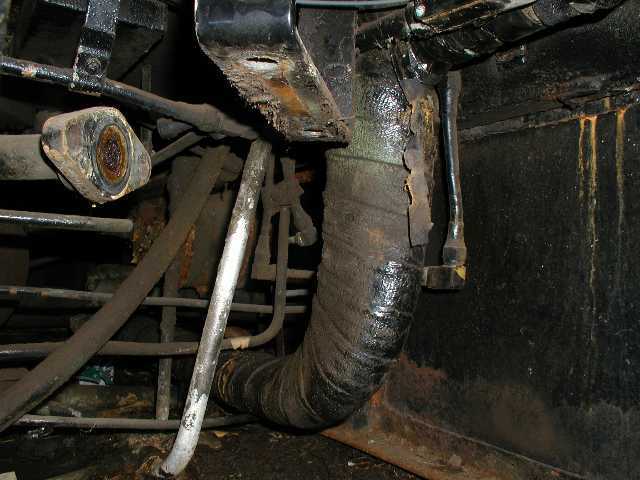 I cannot tell where the copper tube connects to the water system as it is under the cab floor and wrapped in with the heater pipes. Let us hope that the problem does not come back to haunt us. I was able to put in about an hour on the gyro wiring but cut wires and missing labels are proving to be a challenge. The next thing on my list is the problem with the air compressor. I think the issue is leaking high pressure exhaust valves but a tear down is the only way to answer that question. Maybe one of these days, I will get to work on the electrical system grounds.